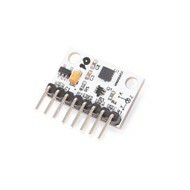 The MMA8452Q is an intelligent, capacitive 3-axis MEMS accelerometer with low power consumption and 12-bit resolution. This accelerometer is equipped with built-in functions with flexible user programmable options, configurable via two interrupt pins. Thanks to the built-in interrupt functions, the host processor is more energy-efficient when continuously scanning data. The MMA8452Q has a user adjustable sensitivity of ± 2g / ± 4g / ± 8g with high-pass filtered data and unfiltered data in real time.